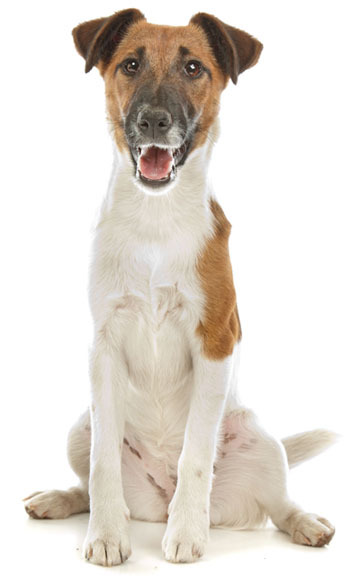 Learn about the temperament and personality of the Smooth Fox Terrier. Discover what he's like to live with, his traits and characteristics and how he generally behaves. And look at lots of Smooth Fox Terrier photos. The Smooth Fox Terrier is a very active dog with lots of energy. He's always in motion doing something or getting into mischief. They are intelligent, independent, crafty, and will try to outsmart you. They bond quickly with new owners and will want to go wherever you go and do whatever you do. They will want to curl up beside you on the couch and sleep beside you in the bed. They certainly don't want to be left home alone all day. These are extremely loyal, affectionate, and devoted little dogs. They are protective and make excellent watchdogs -- they are one of the best watchdog breeds. Their barks are bigger than they are. They need exercise, and will take as much as you can give. They enjoy long walks and lots of play. They also need mental stimulation. They are trainable and moderately quick to learn new tricks. They love to please you, unless you are asking them to do so in front of an audience. They are often dog aggressive. Smooth Fox Terriers think that they are invincible and will not back down, no matter the size of the other dog. Though they can occasionally live with cats, they usually chase small animals, with intent to harm. They are bold but not aggressive toward people and are friendly and outgoing with everyone they meet. They can be little trouble-makers. They will dig tirelessly, and will destroy a flowerbed in seconds if given the chance. They tend to get into things and have been known to push a chair over to the counter so they can climb up and counter surf. Many of them can open refrigerators, drawers, and cabinets. A Smooth Fox Terrier parent really needs a sense of humor, and a sense of humility. Smooth Fox Terriers are excellent with children as long as the children don't tease them. These happy, lively dogs need a lot of attention, but that's just because they really want to be part of your family. They love life! The Smooth Fox Terrier is moderately easy to train. He learns new commands at the average rate. He is neither difficult nor easy to train. The Smooth Fox Terrier sheds a fair amount of hair. You'll find hair stuck to your couch, carpets, clothes and everything else in your home.